Now that you have your Contacts added, Search with simple keywords or advanced selectors to find the those that matter today. Select one or multiple contacts to Connect, reward them with +Kred, tag them, invite them to your Grabs and more. Every time you add an email address, the Engagement Center finds you any other available information, like your Contact’s avatar, physical address, social accounts and more. Add emails one by one or upload a CSV. The Discover tab in the Engagement Center helps you find and engage new Contacts on Social. Search for a keyword to see who is tweeting about it, who has it in their bio and how engaging their content it. 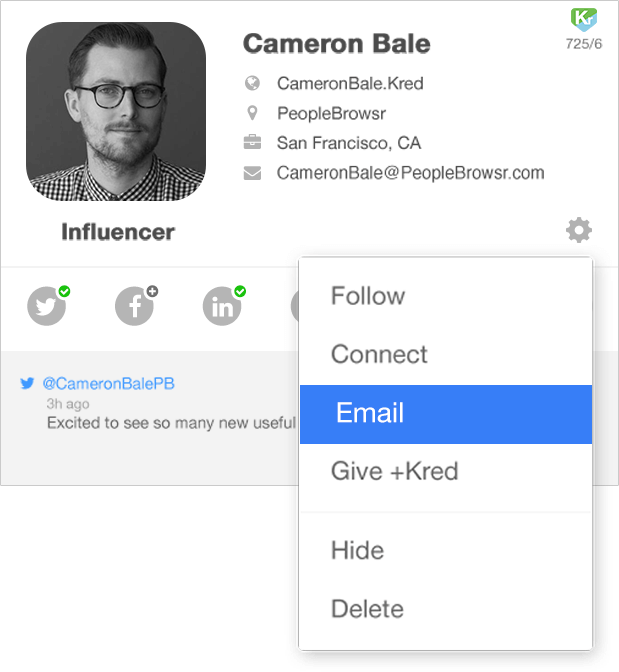 Follow new Contacts on Twitter, invite them to your Grabs or reward them with +Kred. The Engagement Center allows you to select one or many of your Contacts and invite them to your Grabs. The Engagement Center lets you email any contacts for whom you have an email address for. Kred is the world’s most transparent Influence Metric. 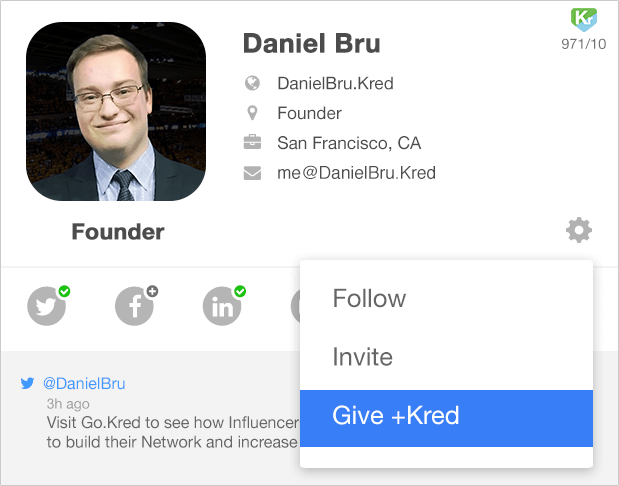 Reward your Contacts by giving them +Kred and an instant boost to their Influence points. Use Advanced Selectors when searching to really narrow down your results!